Do you feel insecure about your smile? You are not alone. In fact, one-third of adults do not like how their teeth look, often due to alignment issues. You have probably considered orthodontics in the past to correct gapped, overcrowded, or rotated teeth, but you do not feel that traditional metal braces are the right option for you. Now, you can get a straight smile with a nearly invisible solution from your dentist in Carlsbad. 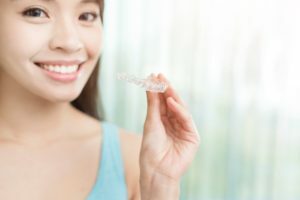 Invisalign does not use any brackets or wires. Instead, custom-made clear aligners are used so you can stay confident during your treatment. Invisalign uses a series of custom-made clear aligners that are worn over the teeth to move them into position. Using 3D scans, they are gradually moved as you progress through the series. You wear each one for about a week prior to switching to the next. You need to be committed to wearing them for at least 22 hours each day. On average, it takes about 12 months to finish your series; at which point, you will briefly need a retainer to prevent them from moving back into their previous positions. When compared to traditional braces, Invisalign is the comfortable and convenient choice. The aligners are smooth so there is no irritation to the inside of the lips or cheeks. In addition to a shorter treatment, you will also enjoy less trips to the dentist because you do not need adjustments. However, you will need to check in periodically to monitor the movement of your teeth. Often, traditional braces cause quite the hassle because you need to avoid many of your favorite foods and oral hygiene can be difficult, but not with Invisalign. Since they are removable, you can still eat and drink what you like; however, it is important to remove them before doing so. If you do not, they can break and you can cause them to lose their transparency due to staining. Caring for your teeth is also easy because you do not have to brush and floss around brackets and wires. Simply remove the aligners to care for your teeth. You need to clean the aligners with a clear antibacterial soap or cleaning solution prior to placing them back into your mouth. It is best to avoid any abrasive products, which can cause scratches to develop. If this happens, they can lose their clear appearance. If you want a straight smile, now you can choose the sophisticated solution with Invisalign in Carlsbad. While aligning your teeth, you will remain confident because no one will be able to tell that you are wearing them. Dr. Megan A. Shelton provides high-quality dental services to the community. In addition to completing the general dentistry requirements, she has many hours of continued education to offer advanced treatments, like Invisalign. If you have any questions about your options for orthodontics, contact her office today to schedule a consultation.